Although usually football is played in the fall and winter, when it's fairly cool out, Colorado football camps are an exception. They take place during the height of the summer's heat. And for the kids here in Denver, experiencing some of the hottest days on record, precautions must be taken to assure their safety. The threat of heat exhaustion, sunburn and dehydration are nothing to be taken lightly. Regular breaks and vigilant hydration are necessary for active athletes training in the full glare of the hot Colorado sun. Experts recommend that kids drink five to nine ounces of water every half hour or so. Parents, make sure that the sports camp your kids attend has a good supply of water on hand at all times and that the staff understands the importance of proper hydration. 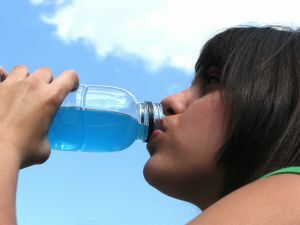 Coaches and camp directors should know the signs of dehydration as well. These include: dizziness or nausea, paleness, excessive sweating and headaches. Although kids seem impervious to the heat, after a few days with too little water and too much sun, heat exhaustion can occur. If too many of the body's electrolytes are lost via excessive sweating and not replaced with adequate fluids, the results can be dangerous. When dehydration turns into the more serious condition known as heat exhaustion, the above symptoms can be seen along with fainting, muscle cramps, confusion and a rapid heartbeat. If a child seems to be suffering from dehydration or heat exhaustion, immediately get him or her out of the heat, preferably into an air-conditioned room if one is available. This is important: if no significant improvement is seen in a half hour, after trying the above treatments, medical attention should be sought immediately. Heat exhaustion is not as serious as heat stroke, but if left unnoticed and untreated, it can progress to that more dangerous condition. Heat stroke is no joke -- it can actually damage the brain or other organs and in severe cases has been known to be fatal. At SportsEddy youth football camps, we always have a trained camp director on hand, who knows how to keep your kids safe. When considering a Colorado football camp for your kids, it's better to be safe than sorry. Ask if the staff is trained in proper hydration and whether they know what to do if a child becomes dehydrated or seems ill during camp activities. By the way parents, don't forget that kids' tender skin needs protection from the sun's UV rays as well. Make sure they are wearing sunblock! When it comes to Colorado football camps and the summer sun, the best offense is most definitely a good defense. Elements of that defense include education; a caring, attentive and conscientious camp staff and most of all, sufficient water. So drink up!